You’re over Hamilton: We get it. After hysterical reviews, obscene ticket prices and all the awards ever, enough is enough. The media coverage has grown so predictable, the hype is so pervasive, it feels like you’ve seen it already, right? Time for Spamilton. The latest takedown by Forbidden Broadway master parodist Gerard Alessandrini is satirical tough love: it bites because it cares. Alessandrini’s respect for Lin-Manuel Miranda’s musical-theater genius is obvious. But so is his fear that that talent will be perverted by fame and pulped in the Broadway meat grinder. If you caught any editions of Forbidden Broadway over the years, you know the score: Alessandrini swipes melodies from current shows and twists the lyrics to stick it to the source. “I am not gonna let Broadway rot,” vows a rapping Lin-Manuel-as-Hamilton (Dan Rosales, nailing LMM’s nasal whine). “Hey, yo! I’m just like a beaver / A young overachiever / And I love being a hot, big shot.” Unlike the hit-and-run revue style he usually favors, Alessandrini sustains an episodic narrative, showing how the mega-success of Hamilton lures its main creator away from the Great White Way and into vapid, pop-culture distractions (Beyoncé, Jennifer Lopez and Gloria Estefan all tempt Miranda to the tune of “Say No to This”). Amid the many Hamilton song spoofs there are strategic quotations from Sondheim’s Sweeney Todd and Assassins, as well as samples from Annie, West Side Story and a dozen other classics. Christine Pedi makes a couple of pungent cameos, including Liza Minnelli crooning “Down with Rap” (after “Down with Love”). Playing the fey and deranged King George III, Glenn Bassett gets some of the best kicks in, skewering Hamilton’s defensively hetero vibe (“Straight is Back”). 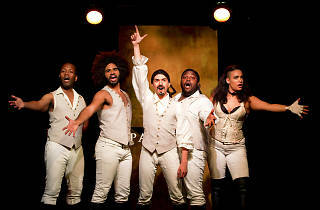 The bulk of the show is carried by a jaw-dropping ensemble in multiple roles: Chris Anthony Giles as a scheming and cynical Leslie Odom Jr; Nicholas Edwards baring his chest and a hundred-watt smile as a raffish Daveed Diggs; Juwan Crawley, who has a dulcet choirboy tenor; and the formidable Nora Schell as all the ladies, juggling the Schuyler sisters with two hand puppets. 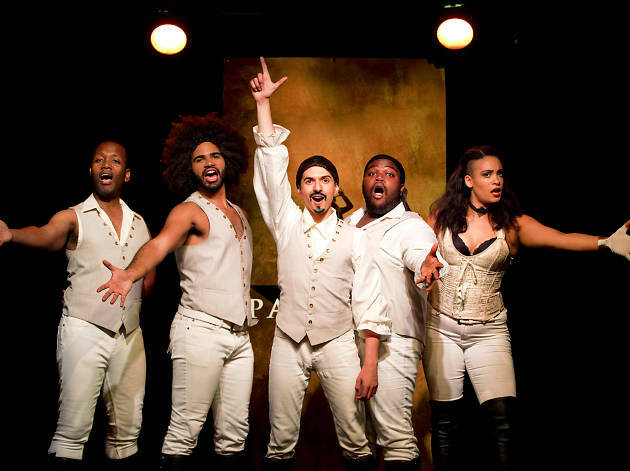 They drive the hilarity all 80 minutes; the laughs are huge and nonstop, and let’s face it: Spamilton may be the closest you get to Hamilton without going broke or waiting for years. Beneath the jokes and bitchery, there is a genuine critique—and it goes beyond Hamiltonian hegemony. In Alessandrini’s satiric world-view, the heart of real Broadway—from the Golden Age to Sondheim—was demolished by the twin forces of Andrew Lloyd Webber in the ’80s and Disney in the ’90s. Today, quality and wit must fight to survive in a wasteland of bombast and treacle, mediocre scores based on song catalogues or cartoons. According to that narrative, Miranda’s current association with Disney is deeply complicated, and that gives Spamilton its edge. Sure, maybe 99% of folks who see Hamilton are instant fans. But it’s possible to love the show and still know that yesterday’s artistic revolution can become today’s soiled $10 bill.…only joking! The Triad (Off Broadway). Written and directed by Gerard Alessandrini. With ensemble cast. Running time: 1hr 20mins. No intermission. Through Oct 30. Click here for full venue and ticket information. David is the Theater editor and chief drama critic at Time Out New York and a playwright and opera librettist in his free time. And yes, he can tell you what shows you should see on or Off Broadway right now. Follow him on Twitter at @davidcote.